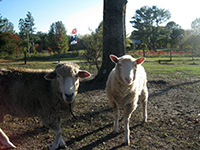 Welcome to Sunrise Farm Bed & Breakfast in Salem, South Carolina! Sunrise Farm B&B is the remaining portion of a large cotton farm, with a beautifully restored c.1890 Victorian farmhouse, 10 acres of gorgeous unpretentiously landscaped grounds, and unique hobby farm. Sunrise Farm offers spacious, individually decorated farmhouse bedrooms and private self-contained cottages. Relax on the large wrap-around porch, while enjoying a hot cup of coffee and some delicious fresh-baked cookies. Then, feed our friendly farm animals! We offer peace and serenity in the foothills of the Blue Ridge Mountains, only minutes from Lake Keowee, Lake Jocassee and the Jocassee Gorges. 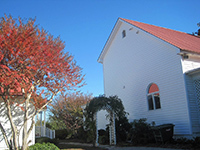 Because Sunrise Farm Bed and Breakfast is known as a relaxing and peaceful destination. In consideration of all of our guests, if you're traveling with a child or children, please call us prior to making your reservation. 864-944-0121 We'll do our best to accommodate you and your children. Thank you. Breakfast is complete with coffee, tea, juice of your choice, warm made-from-scratch pastries, fresh seasonal fruit, and features unique entrees, such as pecan whole wheat waffles with homemade applesauce and crispy bacon. Guest rooms and suites are beautifully decorated with antiques, quilts, thick comforters and extra pillows. Each room has a private bath, Free WiFi, and pretty mountain or pastoral views. The Corn Crib ~ This cozy, unique, self-contained accommodation, is located in the original farm corn crib. You'll enjoy a fully equipped kitchen, a comfortable sitting area and bedroom area with a king size bed, and a full bath. Read the details on each package and choose your favorite! Spent a day and night at the “corn crib” this past weekend – very clean , very relaxing! If you are looking for a low key “get away from it all” get away , this is the place! For a small kitchen, it is equipped well enough to make a great dinner ; followed by an evening watching lamas sheep and goats in the pasture! Very comfy!! Go and recharge! Wonderful place to get back to the basics. My mother and son visit yearly and love the atmosphere. Comfortable clean rooms. He really likes the snacks and loves to visit the animals. I’m sure we will all be back ASAP. We had a great time. Went to attend my nieces graduation. The Sunrise Bed and Breakfast was awesome. The room was comfortable and clean. The owners and hosts could not have been nicer and the farm was fun and the overall atmosphere was peaceful. We stayed in the “Corn Crib” and found it to be spotlessly clean and very comfortable. We really liked the privacy. 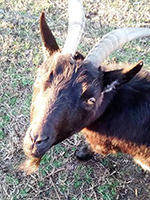 Overall the property is very nice, the farm animals interesting and fun, the B & B main house is very well kept and attractive. 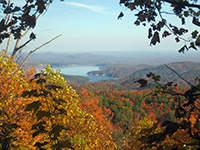 While the area is the South Carolina foothills and the roadways straight, it is very accessible to the mountains of North Carolina and the Cashiers area. 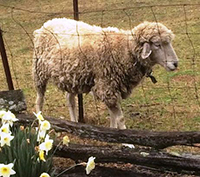 We highly recommend Sunrise Farm Bed and Breakfast. Room Tip: Try the Corn Crib for an unusual and fun experience. It’s not too late! 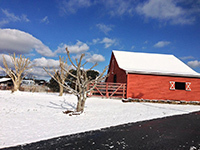 You still have time to purchase a Sunrise Farm Bed & Breakfast gift certificate for Christmas. 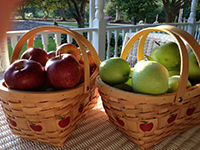 As the South Carolina apple season draws to an end, we want to share our favorite apple breakfast recipe. Yes, it is delicious! 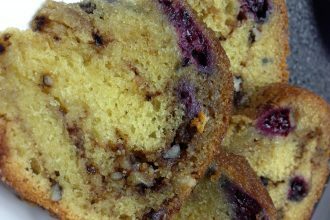 Here’s the recipe…VANILLA BLACKBERRY STREUSEL COFFEE CAKE Refrigerate leftovers (if there are any!). Sip N Stroll Seneca is an Art Exhibit and Wine tasting on Ram Cat Alley March 24, 2018 between 11am-6pm. Come out and enjoy the sounds of rock, Americana, gospel, jazz, and reggae throughout Pickens County from April 20-28. Issaqueena’s Last Ride is a challenging, mountain ride through the beautiful Blue Ridge Mountains and Foothills of South Carolina. Surrounded By The Sound Music & Arts Festival 2018 | Chattooga River Resort and Campground | Thursday, 30.